Dave Hunt's book, What Love Is This? has done to the Christian church in North America what Dan Brown's book, The Da Vinci Code has done for Christianity worldwide. They have both promoted an intentionally incorrect view of an important issue. Both exhibit poor research and both contain untrue statements regarding their respective opponents. It is to their discredit that both authors maintain that their books are accurate and need little, if no revising, at all. Many books have been written to refute Dan Brown's "historical" claims about Jesus. Dave Hunt also has been widely refuted by many articles and books and on public radio broadcasts. He has been corrected about many of the errors found in his book concerning Augustine and Calvin and others and also regarding at least one passage that he misquotes in order to prove his points(Matt. 23:37), yet to no avail. He continues to preach and teach in churches around the U.S., warning against the dangers of Reformed Theology, including its so called "Roman Catholic" roots. Nevermind that the Reformers and the Roman Catholics have had much to disagree about for centuries, including free-will and predestination. I see many Christians today who have had exposure to his book and in turn make exceedingly ignorant remarks about Calvinism and all its related issues. Blame, although ultimately laid on the reader for not exercising discernment, must also be shared by Dave Hunt for pursuing such a topic with literary recklessness. 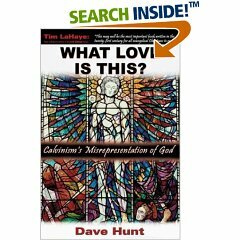 For a short critique of Dave Hunt's book, click here.